Happy Donkeys is a non-profit organization with the aim to take good care of our own donkey family and help other donkeys in need. All our donkeys are fed with high-quality food and receive excellent medical care, if needed. With your help, we can reach our goal of keeping donkeys happy and educating visitors about their behavior and needs. In our sanctuary, the donkeys live in their natural habitat, where they have enough space to run around, play and enjoy the surrounding forest. Donkeys are very intelligent and curious animals that easily get bored, if they don't get enough exercise and stimulation. So instead of tying them to a rope, we take them on long walks, where they can graze and explore. Happy Donkeys is financed mainly by our unique donkey tours and donations, that we receive from caring donkey lovers from all over the world. 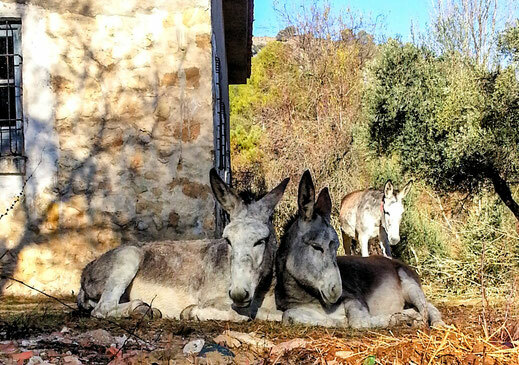 Happy Donkeys regularly helps other Portuguese donkeys in need. 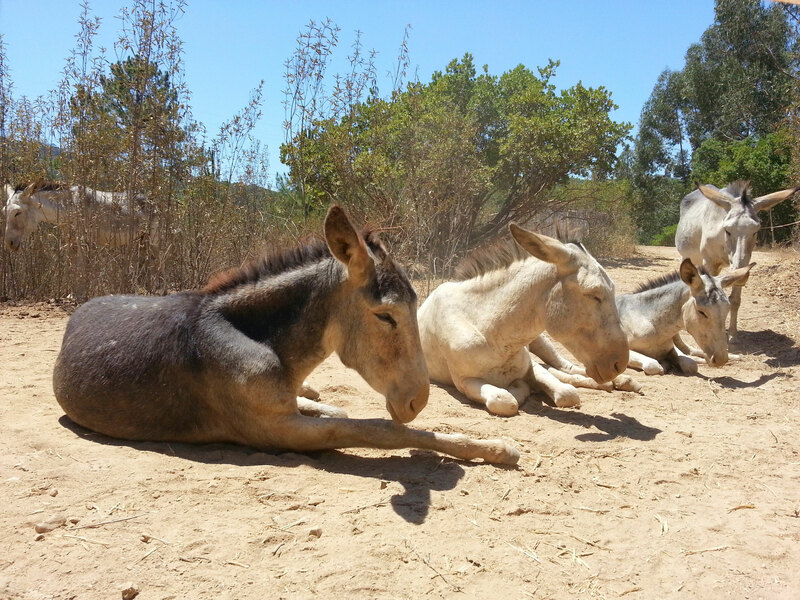 Unfortunately, not all donkeys live the same happy life as our little donkey family. Many of them are tied to ropes, have to stay in a stable all day long and rarely see the sunlight or even the company of other donkeys. Also, their health is not the best. Especially their hooves are often in a bad condition, which is very painful for them. We can never be grateful enough for all the donations you have already given, and we'd like to assure you that everything we raise is spent entirely on the donkeys and our project. Please continue to support us by donating or adopting a donkey. You can send us money via PayPal or regular bank transfer. If you would like to make a donation, please enter “Donkey Donation” in the reference field. If you would like to adopt a donkey, please enter “Adoption” and the name of the donkey in the reference field. You will then receive a monthly report with photos and news about the donkey you adopted. Keep in mind to give us your email address for this! Currently, a herd of five Andalusian Giant Donkeys lives in the Happy Donkeys Sanctuary: Camaron, Lucia, Josefina, Frederico and Luisa. They are all closely related, a lovely family. The head of the family is Camaron. He is 8 years old and was named after the famous Spanish flamenco singer Camaron de la Isla. Camaron is the father of Josefina and grandfather of Luisa. He was castrated a little while ago. When Camaron came to Happy Donkeys Sanctuary, he wasn't happy at all. At his old home, he was treated very badly and often beaten on his head. With lots of love from us, he is now in a very good shape. Although he is still a little nervous about sticks, he is a very friendly and playful donkey. He likes to cuddle and play with the others and is full of energy when we go out for a walk. Children have lots of fun riding on his back and feeding him. And if you just want to walk next to him, it feels like being accompanied by a good old friend. Lucia is the mother of our family. She is 9 years old and has two children Josefina and Frederico and one grandchild Luisa. Lucia's previous owners had to sell her, because they could no longer take care of her. So, a very nice man from Scotland bought her and brought her to the Happy Donkeys Sanctuary. She is a very tame donkey and very friendly to children and adults alike. At our sanctuary Lucia does not have to carry heavy weights or work hard. Because we believe in animal protection, her only job is to care for her family and be petted by visitors. She is very gentle to children, who can also ride on her back. This is a very special experience for them, because Lucia is as tall as a horse, but much calmer. This is Josefina with her first baby, Luisa. She is the daughter of Camaron and Lucia and now four and a half years old. Josefina was born during the first part of our journey through several natural parks on the way to the Sierra de Segura, which is part of the biggest natural park in Spain. Before she was one year old, she had already walked more than 1000 kilometers. This was very good for her and because of this her body development is excellent. When Josefina was one year old, during the night she went to Pajarito, a lovely Giant Donkey belonging to a good friend in Cazorla, who was visiting me at the time. She became pregnant much to young and I was very worried about her. But everything was alright in the end. Josefina just hasn't grown as big as she would have if she hadn’t become pregnant. Josefina has a very kind character and children can ride on her back as well. Frederico was born one month before the beginning of our last journey from Spain to Portugal. He is the son of Lucia and Pajarito, a pure Andalusian breed, very calm and friendly. During the journey, we met many people who wanted to buy him. Several times I was nearly out of money and received offers up to 1500€, but for me it was never an option to sell him. Because of his very good ability to breed, Frederico would had a very poor life, locked up in a stable and only used for breeding. Now he is castrated to ensure that he won’t be able to have babies with his mother or little Luisa, which he has already tried when he was eight months old. Luckily, he has the same friendly character as his parents. Frederico is very kind to people an and children in particular. This is Luisa. She is the daughter of Josefina and Pajarito. She is one and a half years old now and has already traveled more than 1000 kilometers in less than a year, just like her mother. Even though we traveled between 20 and 30 km a day, Lucia was playing with Frederico all the time and enjoying the journey. When Luisa was born, she was very small, because her mother Josefina was still very young. She is smaller than Frederico, who is only two weeks older, but nonetheless she is a very strong and healthy donkey. Luisa is the star of our donkey family and can't get enough cuddles. She loves to be around children and is very kind to people in general. You will love her!